Present State of Issuance of Stamp Papers • Issue of stamp papers by Treasury ( up to value of `10, 000/-) • Issue of stamp duty receipt by various authorized branches of SBI (for value exceeding `10, 000/-). 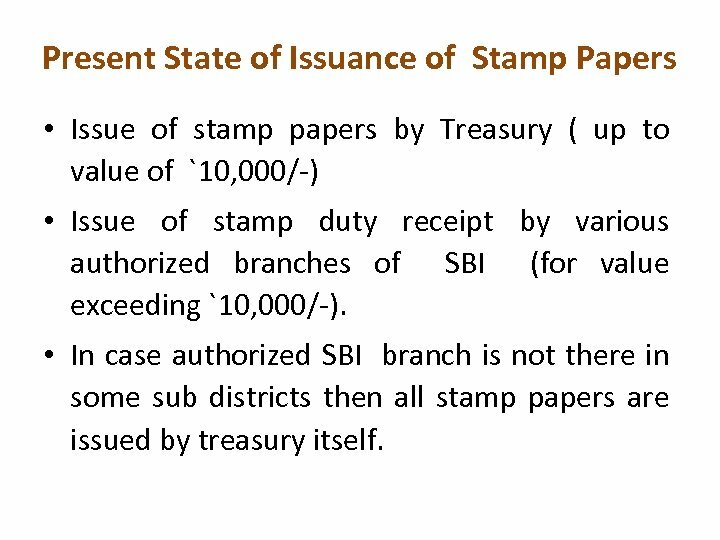 • In case authorized SBI branch is not there in some sub districts then all stamp papers are issued by treasury itself. 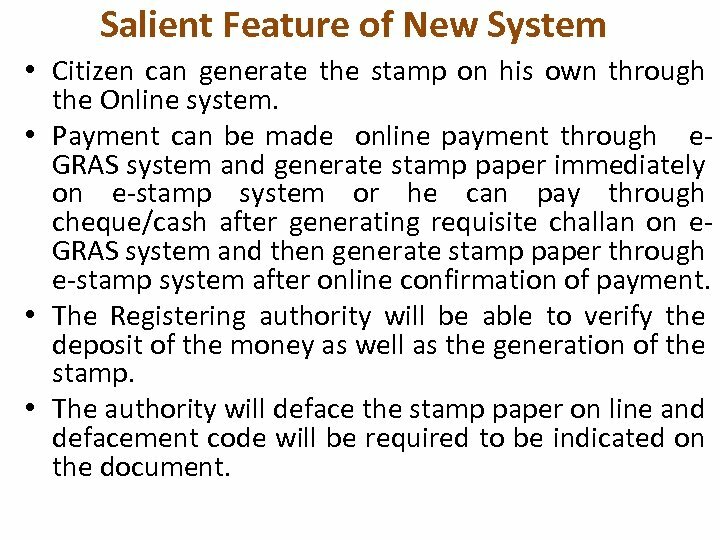 Salient Feature of New System • Citizen can generate the stamp on his own through the Online system. 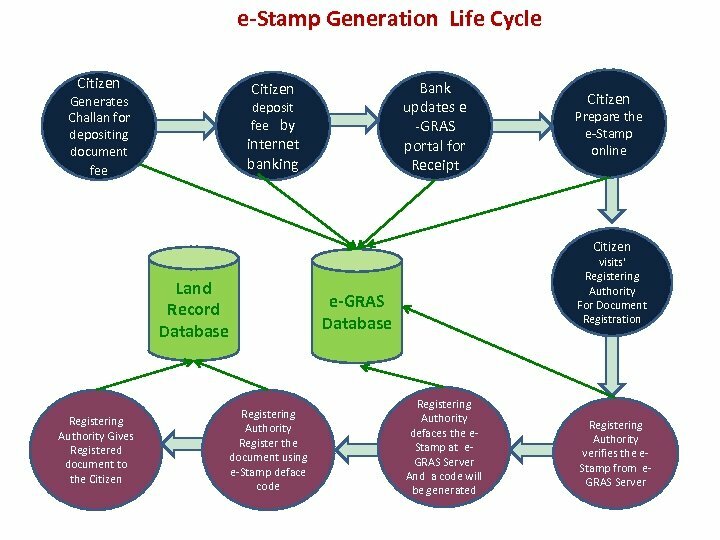 • Payment can be made online payment through e. GRAS system and generate stamp paper immediately on e-stamp system or he can pay through cheque/cash after generating requisite challan on e. GRAS system and then generate stamp paper through e-stamp system after online confirmation of payment. • The Registering authority will be able to verify the deposit of the money as well as the generation of the stamp. • The authority will deface the stamp paper on line and defacement code will be required to be indicated on the document. 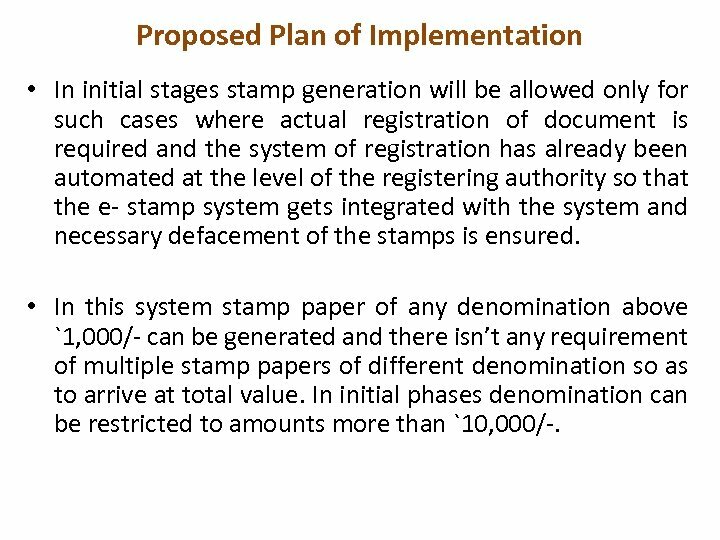 Proposed Plan of Implementation • In initial stages stamp generation will be allowed only for such cases where actual registration of document is required and the system of registration has already been automated at the level of the registering authority so that the e- stamp system gets integrated with the system and necessary defacement of the stamps is ensured. • In this system stamp paper of any denomination above `1, 000/- can be generated and there isn’t any requirement of multiple stamp papers of different denomination so as to arrive at total value. In initial phases denomination can be restricted to amounts more than `10, 000/-. 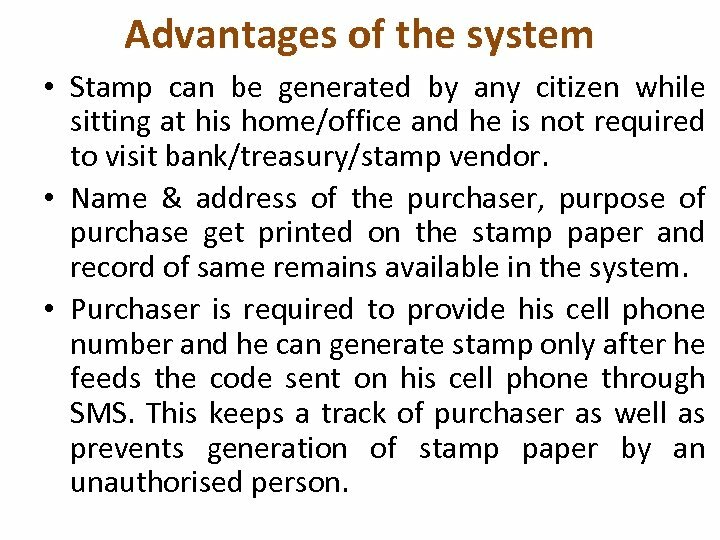 Advantages of the system • Stamp can be generated by any citizen while sitting at his home/office and he is not required to visit bank/treasury/stamp vendor. • Name & address of the purchaser, purpose of purchase get printed on the stamp paper and record of same remains available in the system. 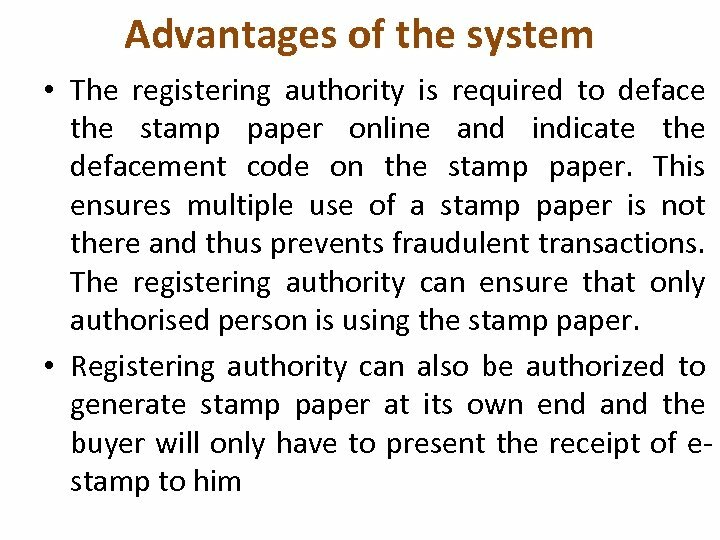 • Purchaser is required to provide his cell phone number and he can generate stamp only after he feeds the code sent on his cell phone through SMS. This keeps a track of purchaser as well as prevents generation of stamp paper by an unauthorised person. Advantages of the system • Details of the purchaser, purpose of purchase, date of purchase etc. 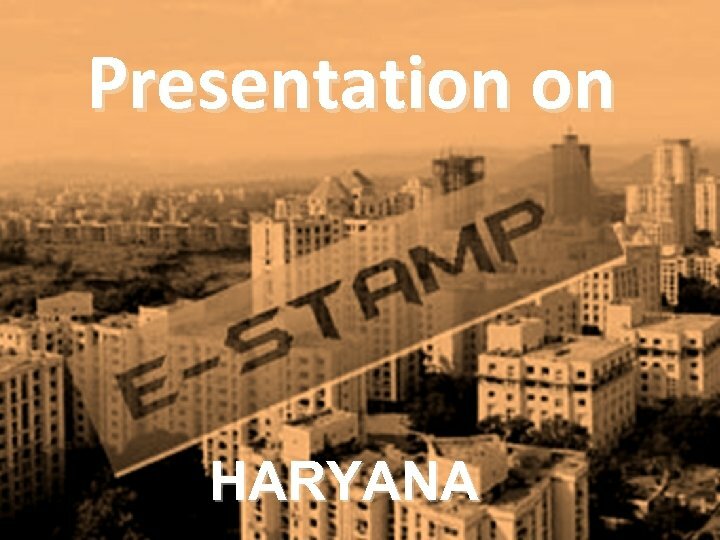 can be verified online by any citizen by logging to e-stamping site and entering the stamp paper code indicated on the stamp paper. 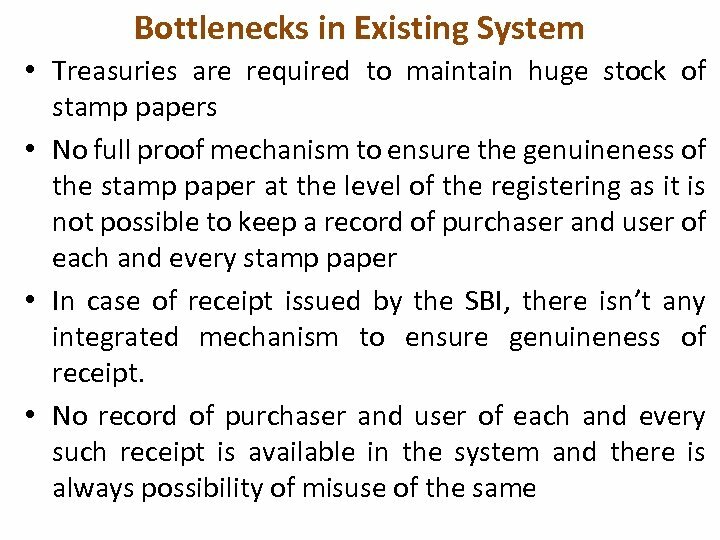 System will also indicate if the stamp paper has already been defaced by some authority and thus a person can’t use same stamp paper more than once. • Back dating of stamp paper is not possible. 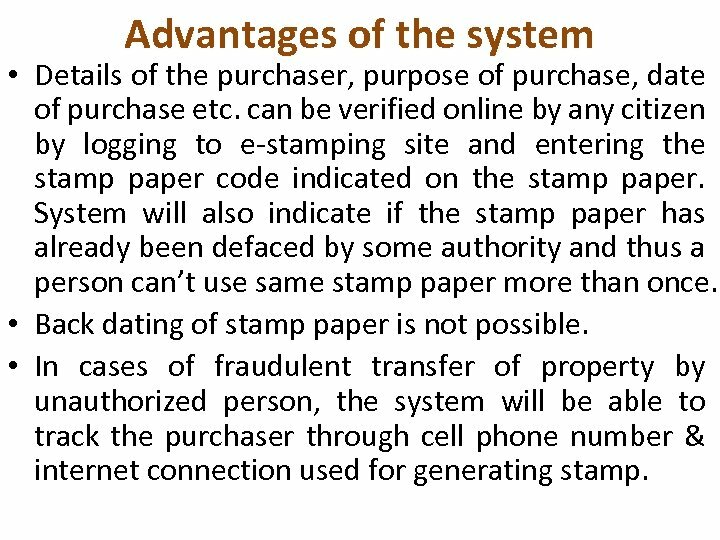 • In cases of fraudulent transfer of property by unauthorized person, the system will be able to track the purchaser through cell phone number & internet connection used for generating stamp.